When God created the Universe, all beings, including humans, angels, beasts, and demons, were created in a certain order. Certain mythologies hold that demons were created from the Elements: Fire, Earth, Water, and/or Air (similar tales hold that faeries and water spirits are made of the same). This is the first in the Demon Masque series, and will be followed by the elements of fire and water/air. The mask is an image sometimes used by psychologists to symbolize the "personalities" we construct for ourselves when among our fellow man, fearful of showing the true "self". 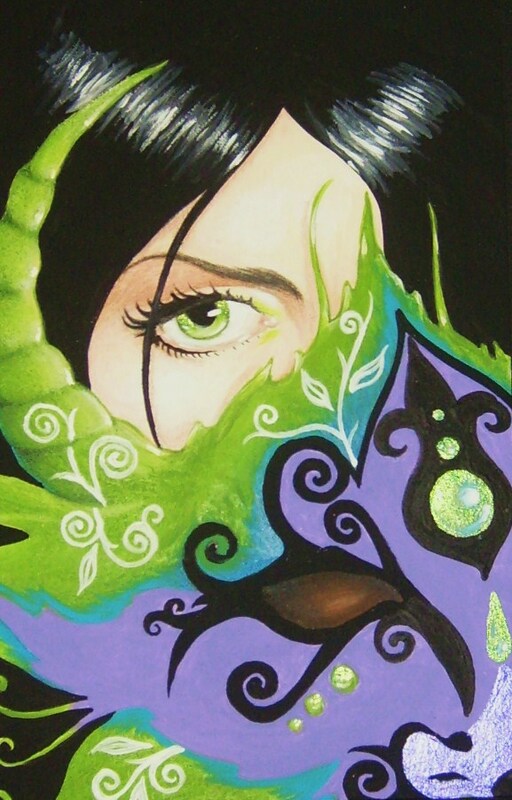 This painting poses the question: is the maiden mortal, demon, or is the mask simply a symbol of her "shadow side"?